Travels around Arkansas and our part of the country to see and hear frogs and toads and people celebrating them. Ever wonder where the frogs and toads go in the winter? They are “ectothermic” or cold-blooded animals that depend on the environment to maintain their body temperature. So where do they hide to avoid being frozen solid in a place like this? The answer depends on which species you are talking about. And before we can address that, we need to describe what’s available in the winter environment. There is water. Water would do frogs absolutely no good if it froze solid, but water has the unusual property that ice floats on the surface. It is less dense than the water it is floating on. In fact, water becomes more dense as it cools down to 39.16° F. Then it become less dense the colder it gets until it freezes at 32°. That means that the temperature of the water at the bottom of a lake or pond will be 39.16° F because the most dense water will sink to that level. There is earth. The earth can become cold and freeze during cold weather, but only on the surface down to the frost line. You see, the earth is a huge heat sink that is not easily frozen. Below the frost line, the earth stays at a constant temperature – usually in the high 50° F range. There is debris. The forest floor is covered with leaves, rotting logs, rocks and stone. Although these are not great insulators, they provide some protection from the wind and winter precipitation. Frogs and toads in Arkansas hibernate in the winter. Their metabolism is greatly reduced or shuts down completely during hibernation. They find a place to “sleep” out the winter in a shelter called a “hibernaculum.” So which frogs and toads select each type of shelter? Where do individual species go? 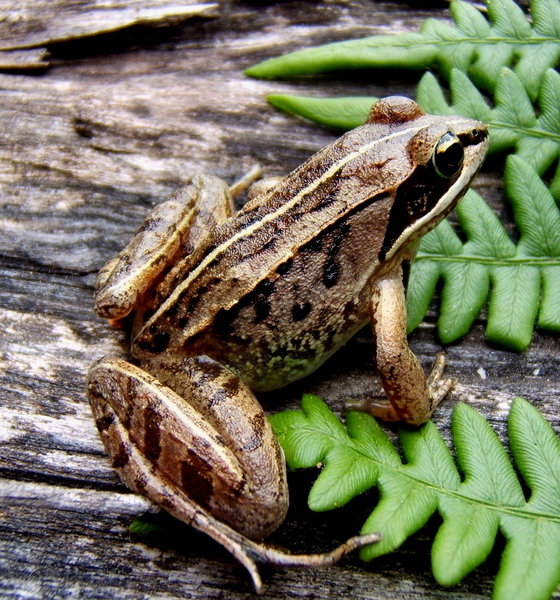 Aquatic Species – This includes the American Bullfrog, Green (Bronze) Frog, Pickerel Frog, and Southern Leopard Frog. These four will dive down to the bottom of the pond, lake, or stream and settle in to the mud and silt for the winter. The water and ice above them are great insulators against the winter. They stop breathing with their lungs, and blood is increased to the permeable skin where oxygen is obtained directly from the cold water (“cutaneous respiration”). Their legs are “spread eagle” to keep them in place. Their second eyelids (nictitating membranes) are pulled up over their eyes which sink deep into their cranial cavities for protection. They don’t get under the mud because there is not enough dissolved oxygen in it and they would suffocate. Their hearts continue to pump a small amount of blood, but they don’t eat and spend the winter in a state of torpor. By the way, Bullfrog and Green frog tadpoles will also over-winter at the bottom and fed on plant material and detritus (waste material). Toads – This includes the Dwarf American, Fowler’s, Western and Eastern Narrow-mouthed toads, and the three Spadefoot species. Toads will take advantage of the warm earth below the frost line by digging a burrow (or borrowing one from another animal). Their metabolism cuts way back, but they continue to breathe and pump blood. The Crawfish Frog also stays in a burrow all winter. Unlike the aquatic frogs, these toads, spadefoots, and Crawfish Frog do not assume a “spread eagle” position, but keep their limbs close to their bodies. 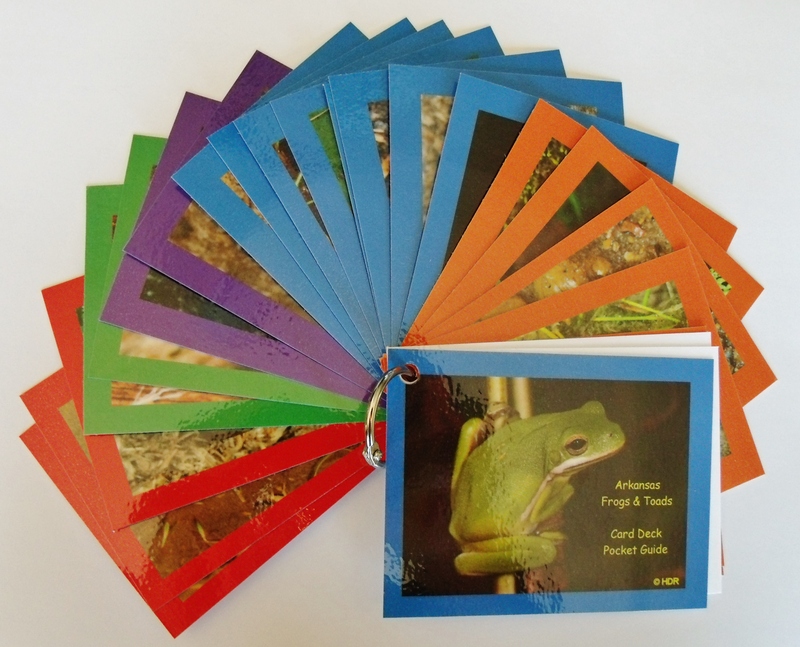 Treefrogs – This includes the Bird-voiced, Cope’s, Gray, Green, Spring Peeper and Squirrel treefrogs, the Boreal, Cajun, Illinois, and Strecker’s chorus frogs, Blanchard’s Cricket Frog, and the Wood Frog (which is not a tree frog). These frogs find hibernacula on the forest floor. They pull their limbs in, protect their eyes, and shut down under leaf litter, in rotting logs, in a shallow burrow or in cracks and crevices of rocks. Their bodies produce a kind of glucose antifreeze that keeps their vital organs from freezing, but in many cases their bodies appear to freeze solid – like frogsicles! Wood Frogs in particular can exist in this mostly frozen state north of the Arctic Circle! In the spring, these frogs thaw from the inside out. Foxes like to scratch through the leaf litter in search of a frozen frog treat. Peg and I spent an enjoyable afternoon at Pinnacle Mountain State Park south of Little Rock on Saturday. Jeremy Chamberlain and Chelsea Korfel brought several frogs and toads including bullfrogs, a chorus frog, green treefrogs, a dwarf American toad, a southern leopard frog, and an eastern narrow-mouthed toad. Maryanne Stansbury, the park interpreter, was a great host for the event which drew many families. The kids were shown how to fold a business card into a frog and then race them. Save the Frogs Day brings public attention to the importance of amphibians, why they are in trouble, and what can be done to help them. They can be indicators that the environment is in trouble. 1) First and foremost: Frogs and toads eat a LOT of insects. One individual can eat as many as 10,000 insects in a season. They do their eating at night so they are not bothered by your gardening chores. Get rid of your ants, mosquitoes and their larvae, sow bugs, flies, earwigs, slugs, cucumber beetles, caterpillars, grasshoppers, cutworms, and pill bugs. Turn them into fertilizer through the stomachs of garden frogs and toads. 2) Garden frogs and toads are interesting, benign, and fun creatures. Children and adults love them. However, they do have some nasty chemical compounds on their skin, so if you handle them, please wash your hands afterward, and keep your hands away from your face or mouth until you do. 4) Garden frogs and toads are environmental indicators. They spend part of their life cycles in water and part on land. They absorb moisture and oxygen through their permeable skins. If there is something amiss with the environment, you will notice the consequences sooner with frogs and toads than with your own symptoms. So if you have lots of frogs and toads around, your water and air are pretty good. 1) Garden frogs and toads need three things: shelter, water, and something to eat (insects). 2) They need hiding places: shrubs, logs, piles of rocks, leaf litter, toad houses, a pond. About toad houses: You can buy great looking, decorative toad houses, but you might not want to put them in your garden for toads. Try turning a terracotta flower pot upside down with a door broken out of the side. Or dig a trench and lay a log on top of it with an entrance at each end. Be sure to place it under a shrub or other shade to keep it cool in the Summer. Make sure your toad house is open on the bottom and the entry is big enough (4 inches will do). 3) They need hibernating places: leaf litter, ponds, burrows. Some frogs hibernate at the bottom of a pond and shut down their systems until Spring. About leaf litter: Don’t be too quick to rake up all your leaves in the Fall. Many animals, including frogs and toads, use piles of leaves for protection in the Winter. When they stir in the Spring there will be lots of bugs to eat in the leaf litter. – Make it deep enough so it won’t freeze solid in the Winter (18 inches or more). – Frogs and toads like still water, so use a minimum fountain or no fountain. – The tadpoles will keep your pond clean of algae. – Frogs and toads will keep it clean of mosquitoes and larvae. 1) Avoid using pesticides, herbicides, and fungicides. Use natural plantings that are hardy without chemical help. 2) Keep grass around the pond cut short. Frogs and toads will hide in long grass so you cannot see them, and then will not survive a mower blade. 3) Don’t put fish in your pond. Fish will eat tadpoles. 4) Provide places to bask and hide. How about laying a log part in, part out of the pond. A pile of rocks is a great place to sun bath and hide if necessary. 5) If you use mesh to cover some of your garden crops: Use a mesh with 1 1/2″ square holes or greater to keep the frogs and toads from getting entangled. 6) Domestic pets: Do your best to keep your dog and cat separate from your garden frogs and toads. Mrs. Frog says, “If you build it, they will come.” Give the garden frogs and toads in your neighborhood time to populate your little piece of paradise naturally. Don’t try to capture frogs and toads elsewhere and bring them to your place – they will probably either try to migrate back home or possibly die. And DON’T buy frogs or toads from a pet store and introduce them to your garden. They are not native creatures. They will become an invasive species and disrupt the natural balance of your local ecosystem. It may take a couple of seasons for your garden frog and toad population to balance out, but you will be glad for the effort you put in to attract them. When do the frogs and toads start to call? This frog call timing chart will help you practice before you go out to the pond to monitor. Learn how to enter your own observation data, map and graph the sites and observations from around the country. You can check out what frogs and toads have been heard in your area and when they started and stopped calling. A unique feature allows you to view map and graphic data simultaneously on a split screen. For more in depth knowledge about Frog Watch Field Scope, attend a Frog Watch Workshop scheduled around Arkansas. Click here for the training schedule. This most asked question about frogs and toads is not easy to answer. The following differences are generally true, but there are usually exceptions. Legs – Frogs have long legs for leaping; Toads have short legs and walk or hop. That effects how they avoid predators and capture food. Frogs can leap away from danger, while toads depend more on hiding, camouflage, or skin toxins. Teeth – Toads have no teeth; most frogs have minor upper teeth. Both frogs and toads swallow their food whole and have no way to chew their food. The teeth in frogs are used to prevent the prey from escaping. Skin – Frogs tend to have smooth, slippery skin (good for streamlined swimming); Toads have dry,warty skin. Toxins – Both frogs and toads have skins that will release nasty toxins to prevent predators from eating them, but toads have an additional pair of Parotoid glands located behind their eyes that are full of toxins. Tongues – Frogs have long tongues that will occasionally miss their mark, but their leaping abilities create more eating opportunities. Toads have shorter tongues so the prey needs to be closer, but they never miss. Bodies – Frogs tend to be light and slim (so they can jump farther). Toads tend to be chubby little critters. Eyes – Frogs eyes tend to be able to see forward, backward, up and down. Toads eyes face more forward. Eggs – Frogs lay their eggs singly, in clumps, or in floating films. Toads lay their eggs in long strands. Caution – Since frogs and toads both have skins that can secrete toxic substances, it is important that you wash your hands thoroughly after handling one and avoid contact with your eyes, nose, or mouth. Peg and I spent a couple of enjoyable days in Rayne, LA for the 41st annual Frog Festival on November 8th and 9th. There were frog murals on many buildings and 109 frog statues like the one above – each one unique. Click on the picture to see a lot more pictures on the Arkansas Frogs and Toads Facebook page.